Do you believe that you have psychic abilities? Are you looking for ways to hone your skills to be able to give readings to your friends, family, and maybe even future clients as you grow confident enough in your skills? If you want to learn to tap into your inner psychic abilities and intuition, many beginning psychics find that using a Tarot deck is a good place to start. There’s a lot of information that you can use to teach yourself, and with practice, you’ll learn how to listen to your inner psychic voice to help you give accurate readings with the help of your trusty Tarot deck. If you want to learn to become a master of Tarot cards, the most important first step is to find a deck that suits you well. Because psychic readings rely so much on your own abilities and intuition, it’s important to find a deck that you like and that has an energy that agrees with yours. However, the vast selection of Tarot cards online is both a blessing and a curse. It means that you surely will have a match for you out there that you love and that you feel a connection with. On the other hand, because there are so many choices, it might mean that it will take you awhile to find it! Here are some tips to help you select the ideal Tarot card deck that is perfectly suited to your energy, your needs, and your future as a medium! As stated earlier, you need to have a good vibe with your cards. So much of psychic readings rely on your energy and gifts, and if something about the cards is disrupting that energy flow, then you will be held back in what you can see. Find a deck of cards that you really have a connection with, one that just “feels right” when you pick them up. 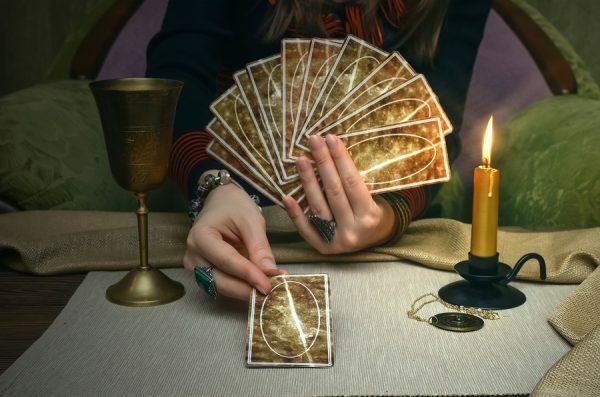 If you personally and intuitively are able to connect with your Tarot card deck, then you know that you’ve found a good match. Be careful to listen to your own intuition during this process and not that of others. It doesn’t matter which deck your best friend thinks has the best designs – it’s your opinion that counts here because you’re the one who is going to be doing the readings. Listen to your own intuition here because this needs to be a personal connection. If there’s a bookstore or new age store near you, then go for a visit and handle all the different Tarot decks they have on display. What sorts of energy do you feel as you handle them? Do you feel a personal connection between you and the cards? If you’re looking online, you can do the same thing by doing a Google search to look through the card images and see if you feel a connection. Remember, listen to your intuition first and foremost! Each specific deck has its own unique sets of images. Go through these images one-by-one or use the web to look up as many images as you can. Analyze your first reaction to these images. Do you find these patterns and colors appealing to you? Are you drawn to them? You should also start to get a sense of the meanings of the cards as you look at their images. This will make it easier to help you remember what each card means and get the appropriate messages from them. Remember, it’s important to look at as many cards as possible, as some decks show a handful of stunning images, while the rest are much more dull and boring. Many aspiring mediums who are new to Tarot prefer to start with a more standardized deck while they get a hang of the way it works. If this sounds like you, then you can start with the Rider Waite deck, as it’s the most common. The images are straight-forward and easy to understand, making it a practical deck. In addition, there is a lot of information available for this deck that will be helpful if you are still learning. However, if you have been doing Tarot for a long time and are looking for a challenge, you might enjoy the depth and complexity that you find from the Thoth Tarot deck or the mythical, abstract imagery that comes from the Shadowscapes Tarot deck. It’s important to note that not all beginners need to start with the Rider Waite deck – only if that is what you feel most comfortable with! What is far more important is having a connection with the cards. Do you find yourself fascinated by the traditional Tarot decks? These would be the original Rider Waite Tarot deck, Visconti Tarot, or Tarot de Marseilles. Or, are you more drawn towards modern and independent decks, like Wild Unknown, Starchild Tarot, or Fountain Tarot? There is no right answer to this question – it all comes down to your own personal preference. However, if you’re having trouble choosing the right deck for you, then deciding whether you prefer traditional or modern designs can help you tremendously in narrowing down your search. Believe it or not, the size of your Tarot deck matters. If the cards are too big, you’ll find yourself dropping them a lot. If they’re too small, they will be difficult to handle properly. Make sure that they are a reasonable size that fits comfortably in your hands, allowing you to work with the cards smoothly without breaking your energy flow. The majority of tarot cards you encounter will be of a decent thickness to ensure you can use them for years to come. However, some cheaper options might be of lower quality and tear or become damaged easily. It’s a good idea to avoid these cheap reproductions, so you don’t end up falling in love with a deck only to have it quickly fall apart. You’re only wasting money in the long run if you buy cheaper cards only to have them go to waste!